Sorry for the late reply. I don't check my PBase comments particularly often. At f30, the angle subtended by the light cone at any particular image point will be about 1.9 degrees. The full solar disk has an angular size of about 1 degree so the maximum field angle at the sensor will be 0.5 degrees for a full disk image at prime focus with f30 objective. If you're planning on imaging the solar surface under high magnification then the maximum field angle will be considerably less. If it's much less than the f30 cone angle of 1.9 degrees, then telecentricity shouldn't matter. If you want to image the entire solar disk then it might be worthwhile to use a zero power telecentric, as you suggest, because the cone angle and the field angle become comparable. With a F30 telescope is it still a good idea to use a collimator or a 'zero power telecentric' to improve the quality if the image through Omega Bobs h-alpha filters? Hi Colin. 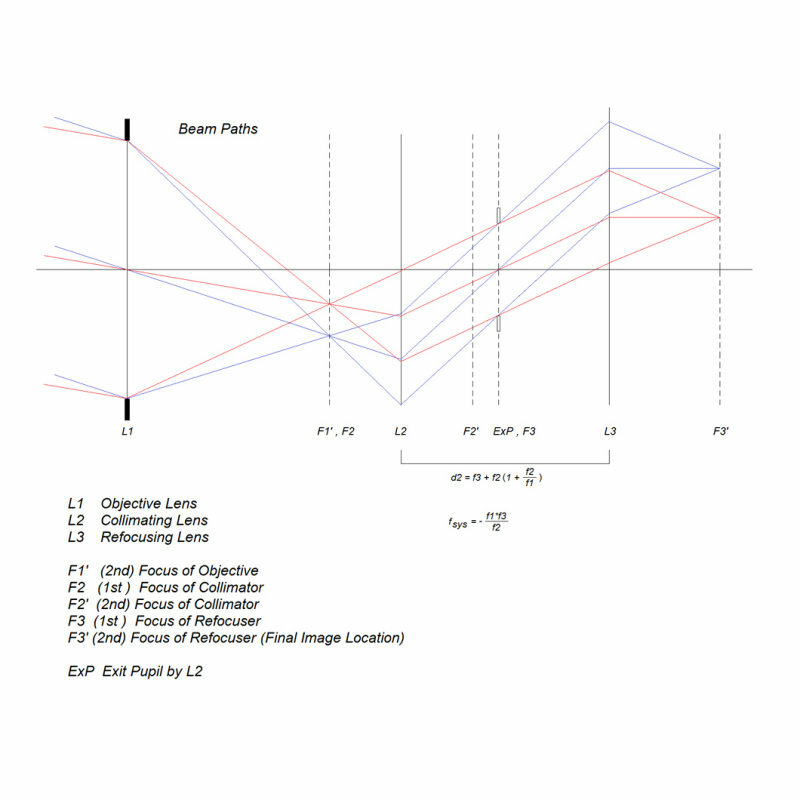 The ExP shown in the diagram is an intermediate one formed by collimator L2. It is the image of the objective lens (L1) produced by L2. In the telecentric system, the final exit pupil of the complete telescope (L1, L2, L3) is at infinity (image space) since ExP is at the 1st focal plane of L3. Peter, am I mistaken in thinking that for the system to be telecentric in object space that ExP needs to be located at infinity (or at least very far in front of the lens system)? Beam paths through a telecentric system. Red and blue beams arise from two different angular locations in space (eg. two different locations on the Sun's surface). The "principal" or "chief" rays entering the telescope at the centre of the objective lens are incident on the image plane parallel to the telescope axis. This defines "telecentric" operation.